When the Big One for One Drop tournament was first announced I wasn’t quite sure what to make of it: Would it be a gimmick event? Would it be a bunch of poker whales rubbing shoulders and yucking it up with the top .1% of pros? Would it even go? These were all questions I had, and it wasn’t until the first entry list was announced, showing just who was playing in the event that I started to think that the Big One for One Drop could be the biggest thing in poker since the 2003 World Series of Poker. As the event drew closer, and more and more names were added to the roles, it became evident that this tournament was going to be a big deal –I think the tipping point for most of us was when we heard that first-place was going to pay over $18 million. By Saturday night, when the final two seats were awarded in satellite events it was clear that the 2012 WSOP was going to be known as the year of the Big One for One Drop. 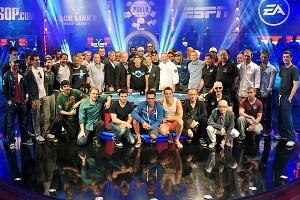 The fact that the tournament was super-exciting, and saw almost the perfect collection of players at the final table, and then went on to put a feather in the cap of one of the game’s most likable and well-known players in Antonio Esfandiari turned One Drop into one of the most historic tournaments in poker history. You couldn’t ask for a better winner in the poker world than Antonio, who is young, charismatic, willing to talk, and will be a great poker ambassador for years to come. Congrats to Antonio and his $18.3 million Big One for One Drop victory. So where precisely does the Big One for One Drop rank in the poker annals? It’s hard to really put the event in perspective a mere day after the fact, but considering the buy-in, the players involved, the overall quality of the play, the wild moments (folded quads anyone), and of course the bewildered/shocked/emotional look on Antonio’s face when he realized he had won the event –along with the touching moment in the post-tournament interview when he gave his father the one-of-a-kind bracelet, will likely make One Drop a lead-in to future WSOP’s and poker programming. There are only a few events in poker history that I can even compare to One Drop at this point, and even though it’s still fresh in our minds I feel there Is only one poker moment in the past 50 years that can claim to have more impact, be more talked about, and be more memorable than the tournament I was glued to for the past three days.